oki-ni's latest SS14 FOCUS, draws attention to something fascinating happening to sneakers this season as they transform into unique hybrids of sports, luxury and fashion footwear. 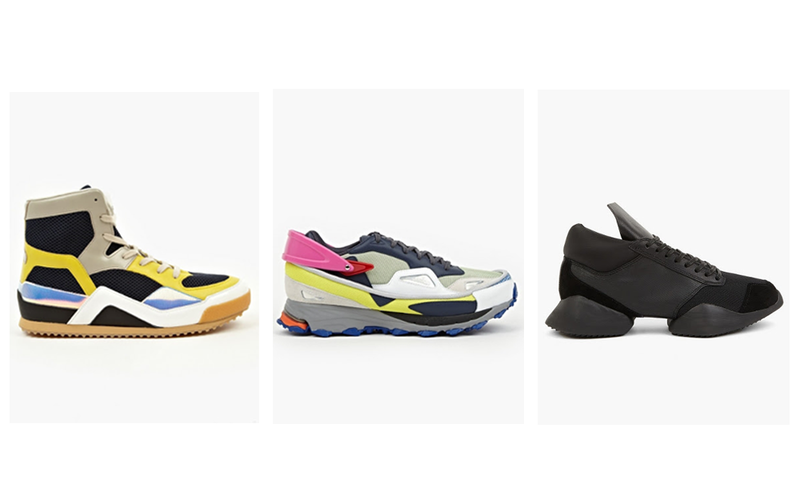 In an iridescent twilight zone created by Set Designer Andrew Stellitano and Photographer Sam Hofman, the stunning shoot showcases a collection of hybrid footwear including "shoe-in-shoe" sneakers from adidas x Raf Simons, striking architectural forms from Rick Owens and luxurious running shoes from Lanvin, amongst others. The 22 Men's Technical Fabric High-Top Sneakers from Maison Martin Margiela are a unique take on a classic high-top sneaker, combining a retro silhouette with futuristic finishes. The Response Trail Sneakers by Adidas Originals x Raf Simons, are a transformation of adidas' 1990s Response Trail style thanks to the unique touch of Raf Simons to create a strikingly, futuristic design. The Men's Runner in Black by Rick Owens x Adidas blends the worlds of avant-garde design and technical sportswear. Crafted from luxury leather and suede, the sneakers combine sportswear details within Rick Owens' minimal aesthetic, producing a must-have style for fans of each brand alike.